A new line of diamond-encrusted smartphones running the Android OS has just been introduced by an up-and-coming fine jewelry brand known as Savelli. The Geneva-based brand, owned by financier Alessandro Savelli, has marked its debut to the marketplace with 11 phone models, ranging in price from $9,000 to $118,000 or more. The product line is known as Jardin Secret, and the devices are designed specifically for women. 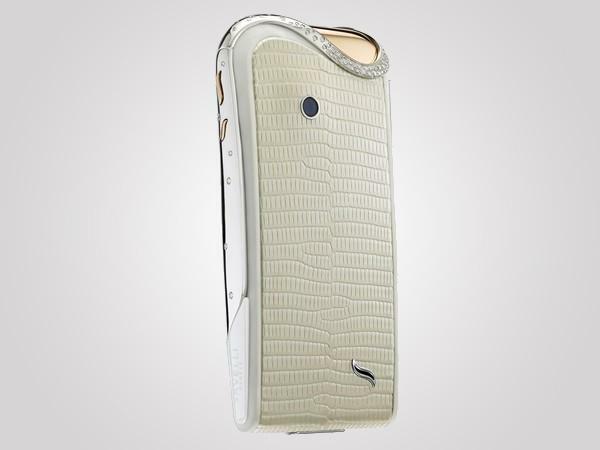 The phones feature 18-carat rose gold, ceramic, and precious stone encrusts, and come in a variety of exotic leathers, like black alligator, blue ostrich, and pearly iguana. Savelli, who will host a party at the Musée Jacquemart-André on July 3, even sought out French DJ and record producer Stéphane Pompougnac to develop custom ringtones for the line. The Jardin Secret collection will be available in July at high-end retailers like Harrods in London, and Printemps in Paris. So, whether or not this kind of thing is up your alley (and whether or not you’ve got $9,000 to spend on a smartphone), we could see it taking off in the high-end fashion world. We’ve already seen celebrities like Paris Hilton and the Kardashians sport jewel-encrusted smartphones and the like, so this sounds like a move to popularize mobile devices as luxury jewelry. Savelli is simply doing away with the hassle involved in getting these kinds of things custom-made.